Ad agencies aren’t the only creative game in town anymore. This week at the Savannah College of Art & Design we held our annual Career Fair. As a professor, I had the privilege of watching our smart kids fine tune their books, fret over their resumes, and gossip in the hallways about which agencies they were going to rush. I watched as several thousand creative kids stayed awake pretty much all week, and then threw on their Sunday best to lurch across the bridge towards the convention center and the futures that lay there. In the hangar-like building, recruiters from 151 blue-chip corporations awaited the students’ arrival, in booths set up to attract the next generation of copywriters, art directors, animators, designers and coders. 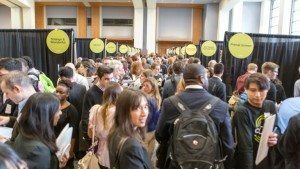 Hundreds of tables were spread out like a Turkish bazaar of free pencils, thumb drives, and branded schwag, defended by only a thin line of recruiters who, when the doors burst open at 10am, were quickly overrun by the unemployed hordes. The thing is, fairs like this – and schools like SCAD – simply didn’t exist when I went to college. Me? I graduated with a nearly useless liberal arts degree. Well, I suppose it is possible I would’ve been snapped up, had there been any companies looking for skinny chain-smokers to write term papers on 17th-century Russian poetry. But these kids? They came armed with real skills. With the ability not only to think creatively, but to make stuff; to actually do stuff. Companies still want people with ideas, yes, but the days of “I’m just an Idea Guy” (two finger guns pointing) are gone. Making your idea get up and walk around the room, that’s the ticket. And it’s a ticket that’s getting kids into more and more places these days, and not just the usual line-up of ad agencies. “We’re no longer competing just with other advertising agencies,” says Bob Jeffrey, of J. Walter Thompson. “Now there’s also Facebook, Google, Vice, Maker Studios and a whole bunch of other content players we compete with.” Amy Hoover, president of recruitment company Talent Zoo, says almost half the creative jobs out there today are not at agencies. They’re at big Silicon Valley powerhouses and cool little start-ups. They’re also at in-house agencies at the big-box companies; your Home Depots, your Targets, your Staples. Their money’s just as green as any agency’s and people have long, happy, wonderful careers in the in-house industry. I know it for a fact. Recently I gave a day-long seminar at Lowe’s in-house agency up in Mooresville, North Carolina. My host was ECD, Brad Stephens, who left an agency career (Mullen, most recently) to oversee a huge team of creatives in a little town on the shore of Lake Norman. Yeah, the town’s small, but Brad’s job description on his LinkedIn isn’t. Currently, I’m managing multiple creative teams and several agencies as we create and manage the various aspects of the Lowe’s brand. Recent accomplishments include relaunch of Lowe’s private decor brand, allen + roth, and a successful storewide wayfinding & communication signage redesign. Key responsibilities include oversight of national consumer, store associate, public relations and recruitment communications, as well as development of retail seasonal campaigns. A huge brand in a small town. In fact, I could hear birdsong at lunch in the company’s outdoor cafeteria. Manning the booth with Todd was Jon Riley, a SCAD ad graduate who showed me some recent work from Adams. One was this OBIE award winner for a divorce attorney. Nice. Bottom line is this. The job market isn’t just ad agencies anymore. For kids who know how to think creatively, and who know how to make stuff, it’s much much bigger. The pedantic copywriter here applauds the overall message of the post while wincing at “accomplishmenets.” Perhaps a word indicating a big rustic-fishing achievement? Great to see so many new creative outlets. While the Whipple philosophy was born in the world of advertising, it’s always championed creativity and not necessarily agencies. Fantastic post and so much to learn something new. This is very useful website. This article is really helpful. Thank you for sharing this great knowledge.